We all know a woman who seems like she is just more fortunate in the love department than the rest of her friends. You might have that one friend who met mister perfect, got married, and continue to live happily together building a family. Chances are, there are more girls that are unlucky in love than there are girls that are truly lucky. The universe is not always kind. Sometimes, a good cosmic push and the right mental attitude can help. Good luck charms can really help skew the magnetic pulls of the universe towards you. If you feel lucky, you are more likely to be lucky. Symbols of luck and good fortune bring a positive tone to your environment. The lucky bamboo can be symbolic and bring you better luck by virtue of the power of suggestion. Studies have shown that 30% of those that carried good luck charms or placed them in their home felt that their luck genuinely improved. There is no explanation as to how they work, but the best guess is that that the charms have their own powers which are increased by the faith we put in them. In order for a particular charm to work, you have to believe in the positive spiritual energy of that particular luck object. If you believe in that then you can allow that object to realize it’s potential and do you some good. Lucky bamboo is a great good luck object because it’s beautiful, alive, easy to care for and can stay in your home. Japanese lucky bamboo sells in garden shops as a bamboo plant however it is actually called a ribbon plant and its scientific name is Dracaena. It is said to bring love and good fortune. It never hurts to have positive symbols of good luck around your home. Such symbols will remind you to have positive thoughts and can be helpful in bringing you luck in love too. Most good luck charms are of the variety that you carry them with you at all times, for example jewelry, amulets, or crystals. Good luck bamboo is ideal for your home. You can keep it in your kitchen or a common area and when you notice it every day you’ll feel better. To care for the good luck bamboo all you need to so is place it in a vase that is a few inches wider than the plant stalk. You can put pebbles or soil at the very bottom of the vase and then a few inches of water above the rock level. When the water level drops don’t forget to replace it. You can keep the plant inside as it does well in about 70 degree indoor weather and should not get cooler than around 55. As long as you change the water and keep it away from artificial heaters or air conditioners, the plant should survive nicely inside. Refresh the water and if the plant starts to have a foul odor then it is time to replace it with a fresh one. The lucky bamboo doesn’t need that much direct sunlight to grow. Just a normal temperature home should be fine. 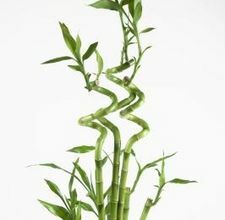 Lucky bamboo is on of the most popular feng shui cures as well. In traditional feng shui the lucky bamboo attracts health, happiness, love and abundance. Bamboo is flexible and hollow on the inside, symbolically allowing spirit to freely flow and heal your being. Sometimes banboo is made into wind chimes that offers a soothing, transcendental sound. The plant is considered lucky when combining wood (the bamboo) the earth (rocks at bottom of vase) water (that it grows in) fire (use a red vase or tie a red ribbon around your pot) and metal (use a glass vase or add a metal coin to the plant if it is planted in a ceramic pot). Make sure to buy two stalks of the plant which is used for a specific feng shui effect to have good luck in love and marriage. Two stalks signify love. Look for one stalk that is straight, and another that wraps around it in loops. If you can, grow the stalks so that one of the stalks has at least three spirals around the other stalk. This represent romantic love. Use 3 stalks for happiness, 5 for health, 2 for love and marriage, 8 for wealth and abundance and 9 for good fortune. For a romantic twist on your lucky bamboo make sure to plant it in a beautiful red glass vase. Use smooth river stones at the base, add water and two lucky bamboo stalks. Look for two stalks that can intertwine nicely. Think positively and envision those two lucky in love bamboos thriving together for years. Hopefully the symbolism will soon represent you and your lucky in love counterpart. The right person will come into your life when you are ready for him and in time your lives will become romantically intertwined.